The Baixo-Alentéjo allows you to experience the spaciousness of the Alentéjo with its vast undulating fields of golden wheat, little white towns and castles. The second part of the journey follows the Vale do Guadiana, then continues further south to Cacela Velha. 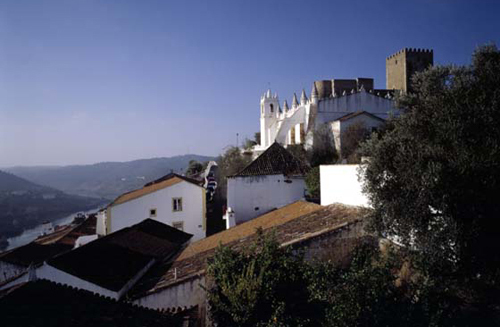 This area, the southern part of the Alentéjo, has great beauty and is untouched by tourism. And so this tour begins in Sérpa. Famous for its creamy cheeses, Sérpa is a sleepy agricultural hilltop town of white houses. Within its narrow whitewashed streets are found traces of the various cultures that have occupied the area. Over the centuries these have included the Celts, the Romans, the Moors, and of course the Spanish. In Sérpa we have found exceptional accommodation. A "Turismo Rural" place where you will receive the warmest of welcomes. There are two overnight stays in Sérpa. The journey from Sérpa to Mertóla passes by long lines of eucalyptus trees, and on the vast estates there are some impressive farms, the so-called "Montes". Mertóla`s historical monuments date back to the roots of Roman and Moorish culture. It enjoyed historical significance with its former status as a Roman and pre-Roman city, as the capital of a Moorish kingdom. The town as a whole is a "vila museu". Sauntering through the narrow streets you will feel as though you are in ancient times and on every street corner you can feel the history of the Phoenicians and the Moors. Recently, an area of about 600 km2 around Mertóla was declared natural park. Here you can find the black stork and the blue magpie. We have set out a cycling tour around Mertóla for you. The tour now heads south towards Alcoutim. The unspoilt Alcoutim is 15 kilometres from the border with the Alentéjo, along the Guadiana river, the natural border with Spain. This town has a timeless quality about it. Ferrymen will transport you on request to the other side of the river to San Lúcar in Spain. A journey down the river to Foz de Odeleite is also among your options. The boat passes by orchards and orange trees and the surroundings are truly idyllic. 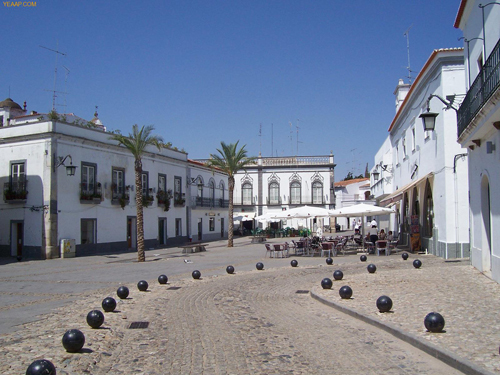 After one night in Alcoutim, you will certainly enjoy the peaceful ride from Alcoutim to Cacela Velha along the Guadiana river, full of breathtaking landscapes. The tour is heading south, through the nature reserve "Sapal de Castro Marim", a humid area with marshes and extended saltpans, many of which were already in use before Roman times. Nowadays they are protected as a nature reserve. Tidecreeks offer an important refuge and breeding ground for many birds such as the stork and the black-winged stilt. There are also herons, searching for food at the borders of the saltpans and now and then a timid flamingo can be spotted. Because of its peaceful atmosphere, "Cacela Velha" is the ideal place to get rid of the stress of daily life. The hamlet has no more than about 25 houses, located high above a cliff and is of great beauty. The clean blue and white fishermen's houses surround old settlement ruins. From Cacela Velha you have an unprecedented view of the lagoon of the "Parque Natural da Ria Formosa". This park consists of 60 km of coastline and was founded in 1987 with the aim to protect the ecosystem of this area. On the sheltered beach you'll find the odd traditional little fishing boat. The lagoon with its marshes, saltpans, islands and narrows are protected against the open sea by a chain of islands. The water of the narrows is warm and extremely nutritious and therefore rich in shellfish such as oysters. The fish and the warm climate attract a wide variety of wild birds. 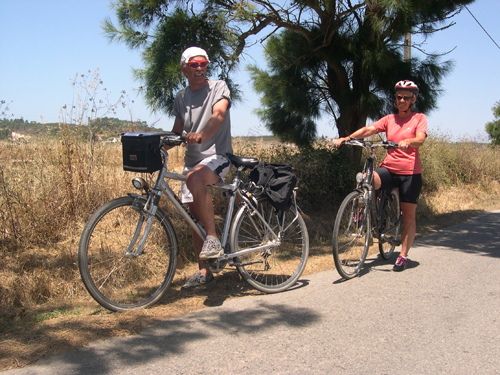 A bicycle tour along the Ecovia or a walk from our attractive and beautifully located accommodation to Cacela Velha and the even smaller hamlet Fabrica are among the options. Some climbing is involved on this holiday although none of the routes take you above 200 meters. You can start any date you wish, but we recommend not to plan your holiday in august, as the temperatures in the Algarve are too high for comfortable biking. * Prices p/p include 7 nights accommodation, breakfasts, complete luggage transport, transfers from and to Faro airport, detailed maps and instructions, descriptions of the area and recommended places to visit. With back-up service.